The word springerle, comes from the old German dialect meaning "little knight". Springerle cookies were made for hundreds of years and some of the earliest molds found in Switzerland date back as far as the 14th century. 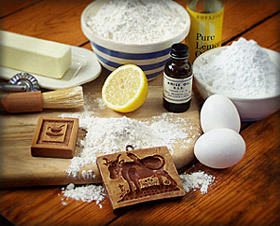 The molds used to make springerle were usually carved from wood or made of clay or metal. Biblical scenes were some of the earliest images portrayed in springerle and were used to educate those who couldn't read or write. Eventually, other scenes were carved and the cookies soon reflected images of holidays, events and scenes from every day life. The cookies were also used to celebrate births, weddings and used as betrothal tokens. Exchanging springerle during the holidays was a common practice very much like we exchange cards today. Springerle is not only the most beautiful cookie but also one of the most difficult to make. They must be made several days in advance. For the tastiest springerle, the dough is chilled for several hours or overnight. Once rolled out and molded the cookies must dry a day to preserve the impressions before baking. The next day during baking, careful attention must be given to the cookies to eliminate any large air bubbles that might crack the cookies. One however, should not be fooled by it's hard texture. Springerle is meant to be a hard and rustic yet delicious cookie.Only the finest and freshest all natural ingredients are used. No preservatives are ever added as we strive to preserve every aspect of the springerle technique and history so you get the best of these beautiful creations.